I'd pick it up, start reading, get over whelmed, and put it back down. Over and over for months. To say that it's information rich is an understatement. 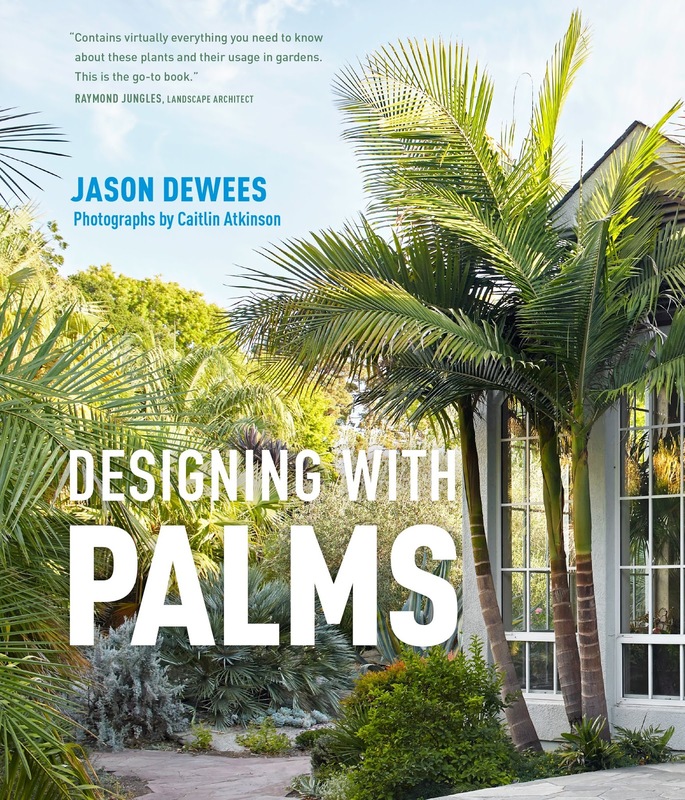 Jason Dewees knows palms. Once I finally let myself just skim—at times reading in-depth, at times not—without attempting to absorb it all, then I really enjoyed it. This book will be extremely useful when I want to learn more about a specific palm I come across in my travels, since unfortunately most of the plants profiled aren't hardy in my Zone 8, Portland, Oregon garden. While the average palm enthusiast will no doubt enjoy this book, it's main audience is—as the title would suggest—garden designers. In the preface Jason writes: "...the palm's icon status is both portal and obstacle to working with palms in design" and in the introduction he continues..."This book aims to release the palm from the prison of iconography so that it can take a natural place in the garden and enrich landscapes alongside the other plants in the plant kingdom." Growing up in the part of the world I did (Eastern Washington) palms have always symbolized sun and warmth, vacation, happy times. They used to be exclamations in the landscape for me, but as I've been exposed to more of them they've stopped screaming "look at me" and just become friendly trees. The book is lavishly illustrated with photos by Caitlin Atkinson, I can't imagine the fun these two must have had traveling and visiting gardens. This photo below, from a section called "The Stories Palms Tell", was taken at the Viceroy Hotel in Santa Monica. It's labeled SURREAL, and it certainly is. Sixteen different gardens (if my count is correct) are detailed in the section "Exquisite American Gardens", "Some of the gardens are private, one is commercial, three are public. They are designed by home gardeners, landscape architects, horticulturalists, botanical curators, landscape designers, collectors and professional gardeners." Reading about the gardens, and getting lost in the photos, was how I spent my Thanksgiving afternoon, darn near perfect if you ask me! Lotusland is one of the gardens profiled, Jason describes it as; "a botanical garden with no visible aesthetic compromises" which sounds about right. I have to admit, it wasn't until reading this book that I realized just what a large a part the palms play in the atmosphere of Lotusland. Or maybe a better way of saying it would be that I only subconsciously realized it. Again I'll quote from the book, "Few places in California, natural or cultivated, approach the intoxicating magic of Ganna Walska Lotusland in as many acres. Its extraordinary vegetation and style are unmatched in public gardens in California. Without Madame Walska's profuse use of palms, it would fall short of its place." When I read the words "To the objection that palms don't belong, the first response is this: If it contributes to the beauty of the landscape, why not?" I was reminded of something Sean Hogan told me years ago about a scene that's played out repeatedly here in Portland. New folks move to the area and request that perfectly healthy palms be removed from their garden because "they don't belong". That sad reality brings me to my biggest gripe with Designing with Palms: the lack of Pacific Northwest gardens in the book. What's up with that Jason? We're easy for a Bay Area resident to get to and we've got some fabulous gardens with beautiful palms! sadly it didn't make it through a particularly nasty winter, although I do see them around town. I'll end this review with a photo chosen to illustrate the wonder I feel when being introduced to a plant I've never seen, or heard of, prior. I give you Marojejya darianii, how beautiful is this? It's from a "wet valley bottom in northeast Madagascar." Although I won't be living among most of the beauties in this book I certainly enjoyed learning more about them. All photos by Caitlin Atkinson, courtesy of Timber Press. A review copy of Designing with Palms was provided to me by Timber Press, with no obligation to write about it. All words and opinions © 2009-2018 by Loree Bohl for danger garden. Unauthorized reproduction prohibited and just plain rude. Obviously I won't be using palms here but those are some lovely gardens. But as a Zone 5 gardener, I have to laugh at you saying you can't grow most of them in your Zone 8 garden. Of course, looking at PNW plants for me is often like looking at UK gardens: I can only dream. Having grown up and started my first garden in USDA Zone 5, I get it. Thanks for the book review - well done. I have to admit I hardly ever consider planting palm trees in my yard but that could be because my palette/knowledge of palms is too limited. There's nothing like a good book (or blog) for a bit of inspiration. There are all sorts of fabulous palms waiting for you to discover them! I think you'd enjoy this book. Thanks especially for that goregous Marojejya darianii. It's exciting to see new to you plants. Must visit Hawaii one day just to see the plants. Yep, I need to start trying to convince Andrew Hawaii will be the prefect place to celebrate our 15th wedding anniversary. While I grew up surrounded by palm trees, mostly very tall Mexican fan palms, I never really appreciated palms until I saw some of the more decorative lower-growing species. My mother hated the Washingtonia in front of my childhood home and eventually took it down. After years of complaints of near-death hits by fronds falling with force from untrimmed trees, my brother recently celebrated the removal of several more of those same trees by the neighbor behind him. (He lives in my childhood home.) Selection and placement is very important, as Lotusland so aptly shows. I remember someone saying once that all Washingtonia robusta are is a trunk. I can see why you wouldn't really want one (or more) in your garden...you'd never see the fronds, just deal with their falling mess. It's a shame so many have bad palm thoughts because of their proliferation. Next best thing to escaping to some jungle paradise? I've been meaning to order this book for months, thanks for the reminder ! I am woefully ignorant on palms even though I was surrounded by them growing up in LA. You'll learn a lot Kathy, there's so much good info in here.